A heinous crime. A valiant hero. An undeniable temptation. LADY CHARLOTTE FRAMPTON is dead…at least, that is what everyone believes. Fleeing from her life-shattering past, Charlotte reinvents herself as Lotte and becomes the companion to a viscount’s sister. All she is hoping for is a simple and quiet life in the country, away from the demons that still plague her. However, her safe haven is threatened when a visitor arrives one day. SEBASTIAN CAMPBELL, son to the EARL OF WESTON, failed in the most miserable way…and his sister had to pay the price. At his wits’ end, he seeks advice from an old friend, and as though fate chose to intervene at last, his path crosses that of a young woman with soulfully deep eyes. The pain and regret he sees in them echo within his own heart, and Sebastian knows without a doubt that he has found his other half. Can Sebastian convince Charlotte that it is never too late for forgiveness and love? This USA TODAY bestselling tale of Sleeping Beauty and her prince shows that no matter how broken you are, you can always find healing through the unfailing love of another. If you like marriage of convenience stories with a touch of mystery, a dash of humour as well as heartfelt emotion, then you’ll love this instalment of Bree Wolf’s emotionally charged Love’s Second Chance Series. 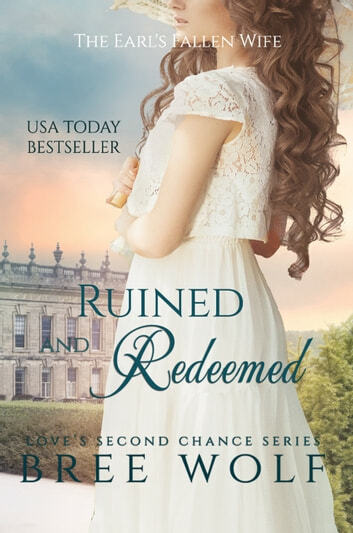 Buy RUINED AND REDEEMED, grab a cup of tea, settle into your favorite reading spot and start this swoon worthy romance now! Awesome book that was hard to put down! Some twist that had me going 'oh my!'. Beautifully written. A page turner from the beginning! Once I started this book, I had to keep reading. I finished the book in one night. I felt like a little girl again, reading on my iPad under the covers because I could not put it down. I absolutely loved it. Every girl deserves her happily ever after, especially those ruined by wicked and arrogant men. My heart was endeared to both Charlotte and Victoria. Thank goodness there are men like Sebastian to right the wrongs. Rarely have I wanted a hero and heroine to find their happily ever after as much as wanted Charlotte and Sebastian to. Bree Wolf continues to write books that tug at your heart strings and take you on an emotional journey. I eagerly look forward to what she has planned for her readers next. Book five in the series is really good. Book two is my favorite but this is close to it. Lotte and Sebastian two people who need healing from the past and present. Can they find love together? Totally hooked on this series. So excited for book six!! Author Bree Wolf created an intensely emotional book in Ruined and Redeemed. I don't think I have ever felt so sorry for anyone as I did Charlotte. From Wolf's vivid writing, I felt Charlotte's guilt, pain, fear, and absolute devastation. Wolf's insightful story-line revealed the harm emotional and physical trauma can cause to our mental health; resulting in the person becoming someone they do not recognize as them-self. As Bree Wolf developed Charlotte's character, I found myself in tears. How could anyone live through all Charlotte survived and ever be the same again? As Wolf brought Charlotte from the abyss she had lived in for three years, she is like the Phoenix rising from the ashes; maturing her from a soul shattered replica of living to a woman of value. Will Charlotte find redemption? Sebastian's a man possessed by guilt, hatred, and resentment towards his father. Wolf skillfully developed Sebastian from single-minded vengeance to a man determined Charlotte will live life again; without fear and terror her constant companions. While at the same time he must protect his sister, Victoria, and find a solution to her situation. Bree Wolf created a fine hero in Sebastian; a good, trust-worthy, patient man, willing to protect his family at all costs. Don't we all need a Sebastian in our life? Victoria's married to a monster without morals or honor; desperately unhappy, she lives day-to-day with the horror of her life. Upon meeting Charlotte, they immediately formed a bond; Wolf created life situations for Victoria and Charlotte characters which they recognize are similar; as Victoria stated: only someone who has been there can relate. Victoria's character's stronger than she thinks and wise in council for Charlotte and her brother. With many plot threads to bring together, Wolfe skillfully wove all the threads together to form a solid novel. She filled Ruined And Redeemed with hurt, anger, determination, devastating situations, family dynamics, redemption, and of course, sweet clean romance. I found her writing clear and easy to follow with well-developed characters. The pacing perfect for the length of the book and the story-line will grab your heart-strings. I received this book from the author. A tragic story, one the leaves one feeling sad and distressed for victims of violence and abuse everywhere. This is fiction and it's gothic in nature, but unfortunately the circumstances and results also occur in our society today. As a facilitator of support groups, I have heard stories like these, and they certainly fuel the crime series we see on television. However, one facet was brought out very clearly, that Charlotte was a survivor and when faced with death, she made a choice to live. Charlotte had done things that she was ashamed of, however anyone who has been in her situation will know that she was not thinking clearly at the time. Furthermore, she didn't have the support of family or anyone else to turn to. When she finds herself under the care of Lord Ashwood as companion to his younger sister, she feels safe in the role of a servant. However, her world is turn upside down once more when Sebastian Campbell comes to take refuge from his own family with Lord Ashwood. When he sees Charlotte, or Lotte as she calls herself, he sees her hurt and pain, but there is another level at which deep calls to deep, and he instinctively knows that she is the woman he wants in his life. The story builds slowly, but Charlotte is once more confronted with her past, at which point the story picks up quickly and becomes fast paced and suspenseful. When Charlotte finally learns that she has supporters who will protect her and keep her safe, she realises that there is more than one to extract justice, resulting in a very satisfactory ending to the book. The story is well written with a good flow of language and a well thought out plot. The book forms part of a series, but is nevertheless a standalone and is clean, however it would be to the reader's advantage to read the series in order as characters in previous books appear in this one too. I received a copy of this book as a gift and this is my honest and voluntary review.